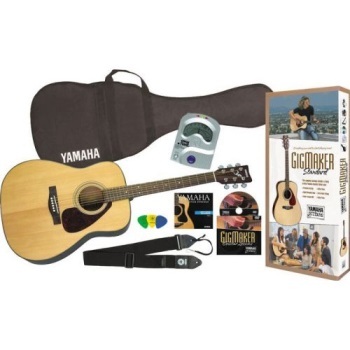 A very affordable starter pack with Yamaha's quality! The Yamaha GigMaker Guitar Pack features the F325 acoustic guitar with die-cast chrome tuners and a spruce top. Features: F325 acoustic w/die-cast chrome tuners and spruce top, Gig bag, Digital tuner, Strap, Extra strings, Picks, Instructional DVD.